Are you looking for one article that has everything that you need to know about Referral Rock? Well you've come to the right spot! 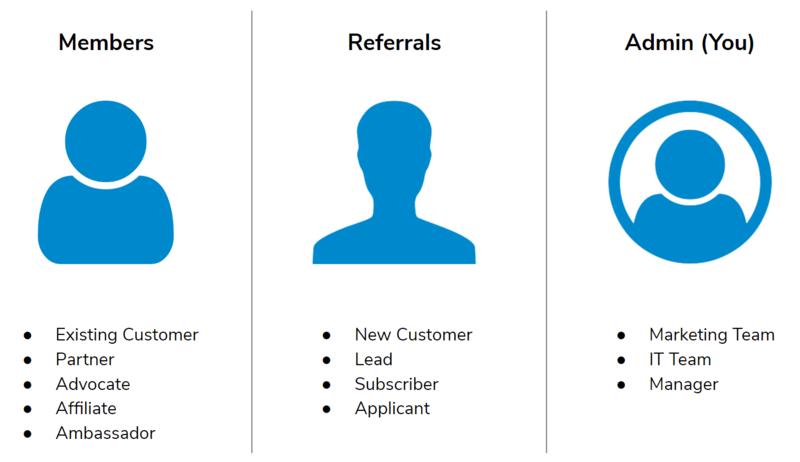 Whether you're a brand new user, someone trying to optimize their account, or you're just looking around, this article goes into great detail on the who, what and how of Referral Rock. This is a big article, so use the Table of Contents to navigate around! Referral Marketing is when you promote your products or services to new customers by using the influence of your existing network (customers, partners, etc.). Referral marketing is founded on the idea of word of mouth marketing but is a more proactive and scalable way to generate new customers. Before you setup your referral program, it is important that you understand the components behind managing the Referral Rock platform. Below, is a brief description of each section of Referral Rock and what information you will find under that section. Dashboard - This is your home screen when you log into Referral Rock. On this page, you will see your program statistics, program actions and program audits. Members - The Members tab displays Members across all programs within the account with the ability to filter by program. From this tab, an Admin can view the entire list of Members, add a single Member, import Members, view Member requests, and manage Email Campaigns. Referrals - The Referrals tab shows all individuals referred by Members. From this tab an admin can view the list of Referrals, add a single Referral, or import a .csv file of new referrals, updated referrals or sales entries. Logs - The Logs tab will give you access to all of the important reports that Referral Rock keeps around things like Payment History, Email History, Integration Events, Fraud and other notifications. Settings - The Settings tab is crucial for setting up and integrating your Referral Rock account. Through this tab you can setup and manage your branding assets, email settings, rewards payouts, integrations, and Member Segments. Referral Rock is a full referral marketing software, which means there are multiple components that make up your Referral Rock Account. When you are building out your referral program, you will be focused on two different experiences: The Member Experience and the Referral Experience. In the next section, we will go over the important things to consider and some best practices when building out each of these experiences. The Program Editor is where you will build out the Member and Referral experiences, including the logic for when rewards are earned and the automated emails Referral Rock sends. In order to gain participants for your referral program it’s important to build the Member experience throughout your customer journey and across your various marketing touch points. Make sure the Member experience is as straightforward and as seamless as possible. The easier it is for your Members to engage with your referral program, the more likely they are to join and continue sharing with their networks. Referral Rock lets you integrate your referral program across all of your customer channels and touch points including your website, email marketing system, online portal/account page, and much more. Once you have identified your target Member audience, you should have a plan in place for getting them registered for your program in the easiest way possible. The default registration path for any referral program is the Registration Page, but we also offer options to auto-enroll members through an One-Click-Access URL (email marketing) or iFrame (on website). If you have a .CSV file of your Members, you can also use our Member Import option to import them directly into Referral Rock. Once a Member joins your program, they will gain access to their personal sharing dashboard (built out on the Member Page) which hosts social media and email easy-share options. Make it simple for members to share by providing them with pre-drafted social, email, and SMS messaging (formatted on the Member Messages page). Once a Member shares and their Referral takes the desired action, they'll get rewarded based on the rewards rules and criteria you define. See Reward Section below for how to set this up within Referral Rock. Now that you have a developed a plan for attracting new Members, you will want to focus on the design of your referral experience. For most of your new leads/referrals, this will be the first time they will interact with your business and brand. Make sure that you start the relationship on a good foot by giving off a great first impression! After a Member shares your business with their networks (through the sharing options on their Member Dashboard), the new leads will start to discover your company and brand. This will drive the new Referral to your Referral Page where they will hopefully take your desired action (i.e. make a purchase, complete a lead form, etc.). Any incentives or urgency drivers. Do they get a discount or other incentive? You want to make it attractive enough for the referral to take an action. A clear call to action. What do you want these new leads/customers to do? Make it easy for them to take the next step. If your sales process involves multiple steps, you will likely want to update your referrals' status as they reach those sales milestones. Referral Rock allows you to put referrals into four different statuses, which we use to line up with your sales workflow. The four statuses are Pending, Qualified, Approved and Denied. Referral Rock gives you control to customize your referral rewards based on an advanced set of rules and triggers. Not only does this allow you to map your rewards to events in your sales process (see above), but allows you to determine when, what, and how the reward is fulfilled. When a triggering event occurs, like a request for a quote or a completed sale, Referral Rock will run though your reward rules to confirm that all of your reward qualifications were met before issuing a reward. Reward rules allow you to specify things like what referral status triggers a reward, what the reward amount will be, if there is a minimum or maximum purchase amount to receive a reward, and if you want tiered rewards. Triggers- Rewards will be given to Members and Referrals based on referral status triggers. For example, if you want to reward a Member when their referral becomes an Approved Referral, you will set up your reward rule to indicate that. Tiers- Want to give your Members an extra incentive for giving more referrals? You can do this through the tiers option on the reward rules page. Referral Rock offers many different types of reward payouts including over 100 gift card options, PayPal, discount coupons, and API/credit based rewards. If the reward happens online, we can automatically fulfill and distribute it for you. If the reward happens offline, we’ll provide you the tools to easily manage your rewards. You simply set the reward criteria and we’ll take care of the rest! Now that your program is designed and integrated, it’s time to launch and increase engagement. Once you have setup your ideal referral workflow, it's time to promote it to your desired Members! Don't expect your program to go viral overnight. Successful referral programs are the result of well thought out promotion plans. Remember, you want to have a good mixture of both ACTIVE and PASSIVE strategies for asking new Members to join your program. 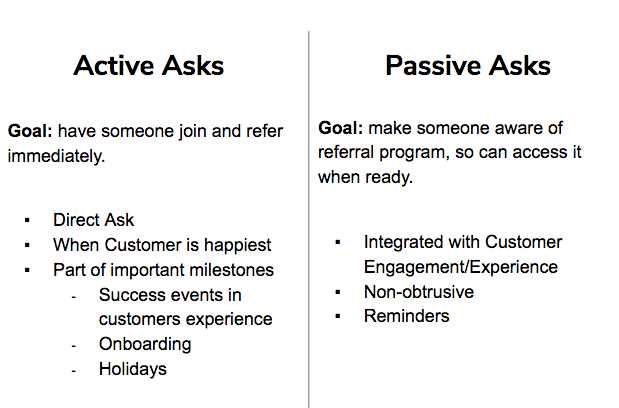 The diagram below shows the difference between an active and passive referral strategy. As discussed above, it's important to keep your Members engaged and coming back to your referral program. This way they’ll continue to share and ultimately, you'll get more referrals! Incorporate with your marketing channels and touch points (see Promote section above) - focus on creating awareness without detracting from the original content the Member is already engaging with (For example, a banner advertisement on your website homepage or a mention of the program in an e-newsletter). And don't forget, we are here to help! Reach out to your Customer Success team member if you have any questions about the general setup and maintenance of your Referral Rock account!